Now before I go any further, I must disclose that this review features dairy-containing items. While I have a severe intolerance to gluten (with debilitating consequences if I am glutened), my dairy intolerance is far less so. At the time I discovered I had to cut gluten from my diet, I was also severely sensitive to dairy. Over the years, the intensity of my sensitivity has decreased and on the rare occasion when I have consumed it, I no longer react. Despite this, and although I made an exception for this rarified and once-in-a-lifetime opportunity, I have and will continue to keep a vigilant dairy-free diet in my day-to-day life because my body simply functions better without it. 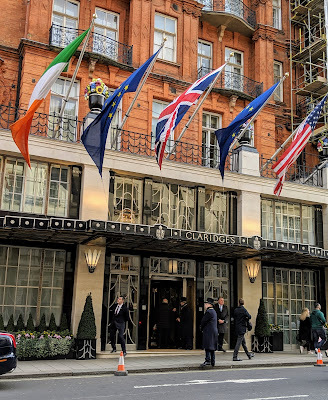 A word to the wise: if you are dining at Claridge's, make sure to arrive with a hearty appetite. The prix fixe menu features unlimited servings of tea, sandwiches, and sweets, so it's best to arrive with an open mind and empty stomach. The experience is a real world version of "Be Our Guest" from Beauty and the Beast, just without the spontaneous singing and dancing! The moment you walk into Claridge's historic foyer and reading room, it took my breath away. The room is absolutely beautiful: live cello and piano music is playing, and art deco era mirrors line the walls, giving it a sophisticated, swanky feel. The staff are all incredibly welcoming, and as I was seated at a cozy table with a lovely view of the main foyer, my anticipation for the coming meal grew by the second. I made sure to alert the dining team that I was gluten-free when I made my reservation, and called back a month out and a week out to double check (because I am always nervous about these things). Each time, I was assured by the staff I would be well taken care of, and I needn't have worried because as soon as I was seated and provided a menu, the lead waiter for my table assured me everything was gluten-free. The first order of the meal was selecting the first tea to start with. With a curated and detailed tea list, I enjoyed reading about the various options and recommendations for which teas are best enjoyed with milk, lemon, or neither (I opted for teas sans milk). After deliberating, I decided to go with the Claridge's blend for my first pot, which is a rich and aromatic English breakfast tea. I loved the intensity of the flavor, and had fun swirling in brown sugar cubes for added sweetness. When my waiter presented the sandwich course, my jaw dropped because the tiny finger sandwiches were just so adorable and perfect. Comparing them to the gluten-full sandwiches others around me were eating, they hardly looked any different. My favorite of the sandwiches were the chicken and ham, with the cucumber and smoked salmon ranking in the middle of the pack. The seasonal savoury (a polenta cake) and egg mayonnaise sandwich were my least favorite, but regardless I did finish every bite. Though I was able to rank each sandwich, all more than earned top marks from me. It was fun to have a contrast of flavors and textures in each sandwich. The gluten-free breads were unbelievably soft, yet sturdy and the ingredients were fresh and flavorful. I really appreciated sampling a range of sandwiches, each with their own profile and strengths. Read more about each of them on Claridge's menu. After working my way through two plates of sandwiches (saving enough room for dessert), it was time to transition to the sweets course, which prompted a new selection of tea. For this course, I chose the Cornish Earl Gray, which is the only English-grown tea in commercial production from the first English tea garden on the Cornish Estate of Tregothnan. It had a nice robust flavor and a touch of citrus owing from a touch of bergamot oil. I did not sweeten this tea, and it worked in contrast with the rich, sugary offerings on order. In this course, I was presented with two scones, clotted cream, jam, and pastries. Once again, when I was presented this assortment, I was floored that all of this was gluten-free. It absolutely looked too good to be true. I enjoyed both scones (one plain, one with raisins) with the fragrant, fruity jam, which is infused with tea. The scone was soft and chewy, and I really enjoyed their perfect size and shape for a perfect tasting. I did not try the clotted cream, not wanting to voluntarily add additional dairy to my meal. The pastries presented included a chocolate "taco" (sorry, that's the best way I can describe it! ), an apple tart, a coconut-covered chocolate ball, and a layers pastry with a cookie-like base and chocolate top. Unlike the sandwiches and scones, these pastries did look different than their gluten-full counterparts, but not negatively so in comparison. They were still very adorable and impressive! By this point in the meal, I was quickly reaching the point of satiation so my memories of each are less distinct, but I enjoyed each pastry equally. Clearly crafted with care, the pastries were decadent and had spot-on textures without being overly sweet. As this symphony of a meal came to a close, the gluten-free pastries were the perfect notes to end on. 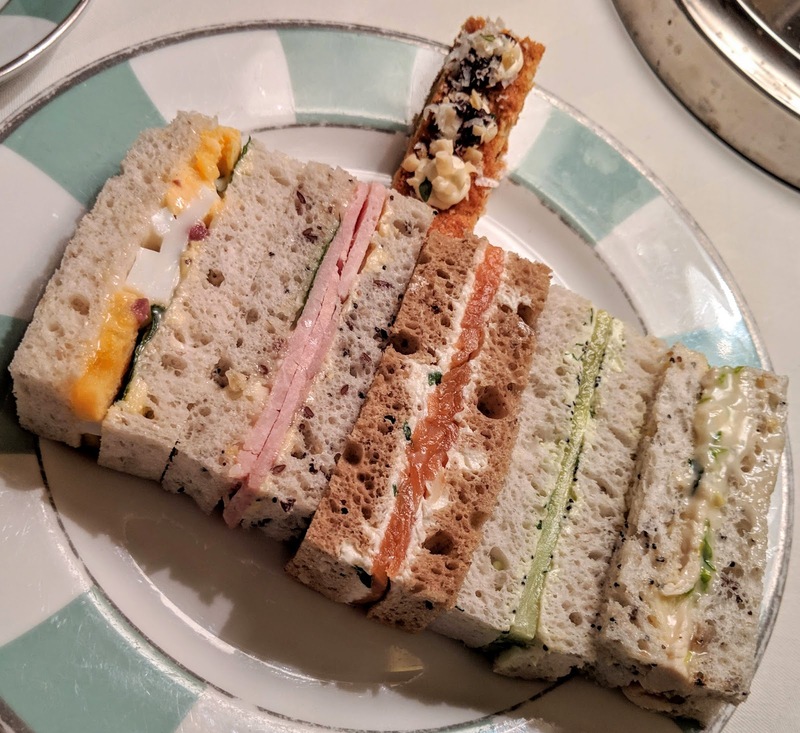 If you have the opportunity (and can afford to do so), I cannot recommend Claridge's afternoon tea enough as one of the most memorable and enjoyable experiences in all of London. The food is divine, the atmosphere is sophisticated, and the service is impeccable, resulting in a dining experience that is truly unlike any other. If only for an afternoon, I was transported into a fairytale land all my own, far from the day-to-day stresses of life and constant vigilance that comes with being gluten-free. I cannot thank the entire team enough for their hospitality and artisanship with every aspect of the experience. 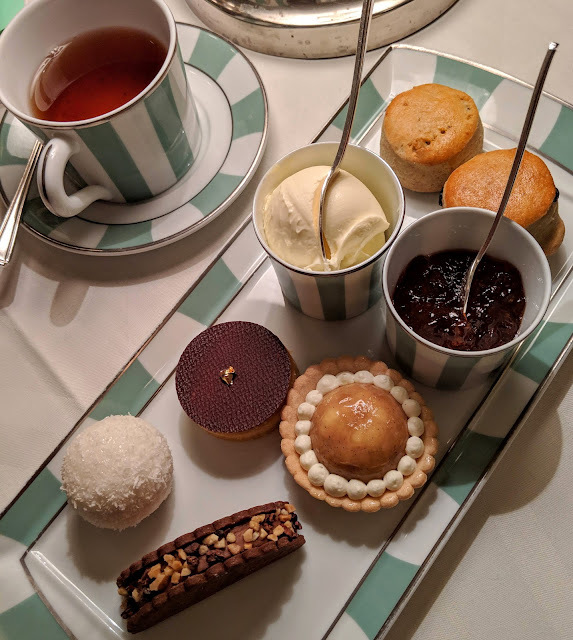 I don't know when or if I will ever have an experience like this again, and know without a doubt that having afternoon tea at Claridge's is an experience I will cherish for the rest of my life. 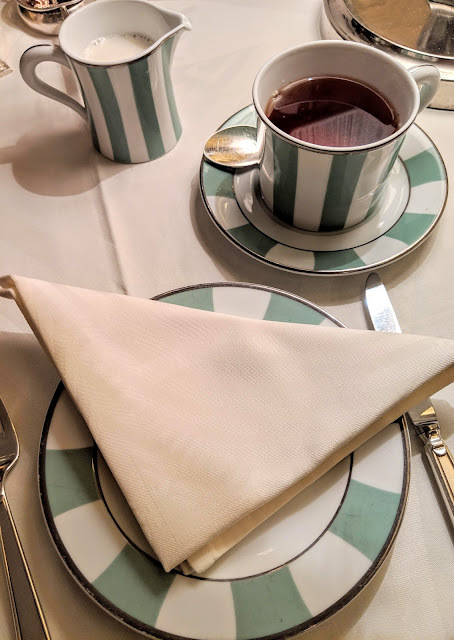 If you are looking for a gluten-free and vegan review of Claridge's afternoon tea, click here to see a recent post on the blog Around the World in 80 Pairs of Shoes. Disclaimer: This review is based upon the information I have at the time of the review and does not reflect changes in ingredients or availability of items. Please contact Claridge's directly for up-to-date information and feel free to contact me with any questions or comments. I was not compensated for this review and it is a reflection of my personal opinion.